Durga is said to be the Goddess of power. The worship of Goddess Durga is especially called Goddess of Durga Shakti. The worship of Goddess Durga is considered to be the main festival of the people of Bengal, but this worship is done in some form throughout India. Whether North India or South India, East or West, Durga Puja is important for every caste, religion and community of India. Durga Puja happens in the month of Ashshin (October-November). Preparations begin almost two months before the beginning of the worship. Three or four months already sculptor become busy with making idols. Shops are decorated in markets. Craftsman begins to make a variety of goods and toys and to buy clothes and jewelry and other things in the markets. Three-four months already, sculptors become busy in making idols. Shops are decorated in markets. Craftsman started to make a variety of goods and toys and clothes and jewelery in the markets. Durga Puja runs for ten days. On the first day, the goddess's statue is established with mantras. On the day of Pandal and Sixth Day in the cities and villages, the idols of the monastery named Mahishasur were established in the Pavallians, in which Durga, Lakshmi, Saraswati Ganesh and Kartikeya were situated. In some places Durga temples also have permanent (Permanent) statues. The worship of the Goddess keeps worshiping for ten days. In the days of Durga Puja, there are government holidays and the school college university office is closed. There is a fair atmosphere of fair and gay. 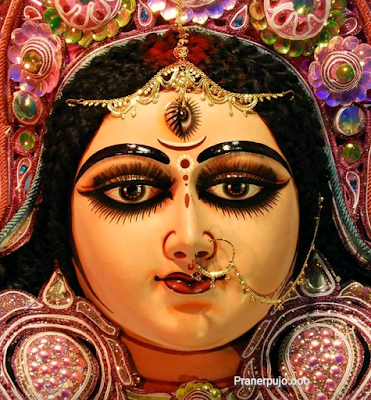 Every year Durga Puja is Celebrated after Navaratri that means on the last day of Navaratri. Durga Start on Sasthi and ends on the Day of Dashami. Dashami is the last Day of Durga Puja that day the statue of Durga Mother is immerged into the water of River. 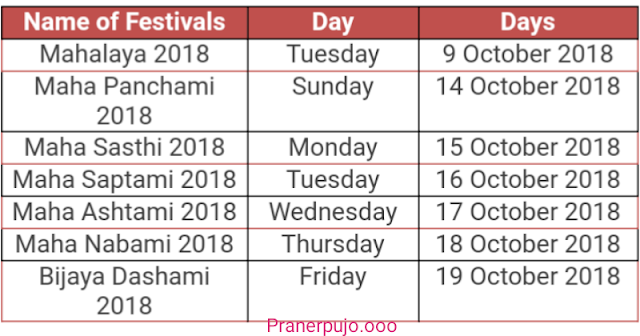 This year Durga Puja will be Celebrated 10 Oct to 19 Oct.
Durga Puja is about Five Days Celebration includes - "Sasthi", "Saptami", "Ostomi", "Nabami" and "Dashami". Mahalaya also a important day of this festival. 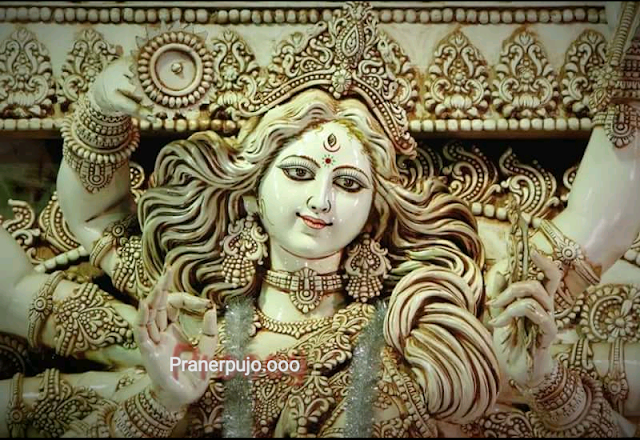 Mahalaya is the Beginning of the celebration of Durga Puja. It's a Historical Day of Durga Puja, so that day has so much importance for us. This year Mahalaya is on the day of 09th October,2018. The first day of Durga Puja called "Sasthi". This Year means 2018, it will celebrate on 15th of October,2018. It is the beginning of the Greatest DURGA PUJA. The Second Day & the main Day or Main Puja Start with this Day called "Saptami". It's also Called Mahasaptami. In this year it will celebrate on 16th October,2018. The third Day of Durga Puja or the main 2nd Day of Durga Puja is called Ostomi. It is the most important day during the day because lots of Puja happens in this Day. This year it is on 17th October,2018. After The Day of Ostomi, Nabami is an another main Day of Durga Puja because after this Day the Puja will be ended. 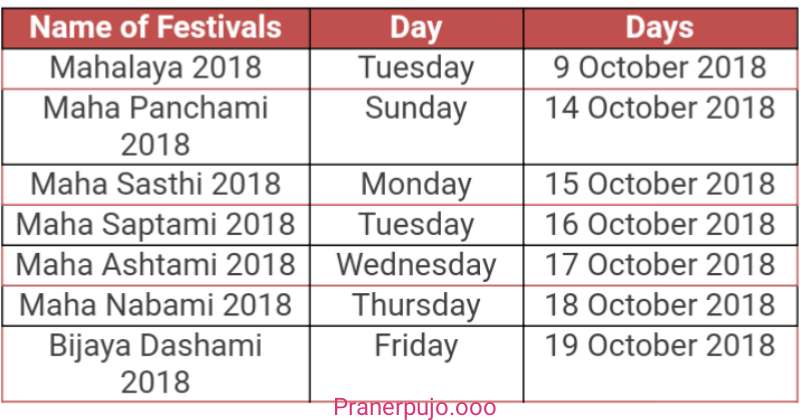 So this year Nabami is in 18th October 2018. The Final Day of Durga Puja is Called Dashami or Bijoya Dashami. It is the Final Day of Durga Puja. On this day day Statue of Maa Durga is immerged into the River. This year it is on 19h October,2018. Navaratri also ended on this Day. On the Day of 21 Ashshin,1425 of Bengali Calendar the Mahalaya Wil be Celebrate in this year. On the Day of 28 in Bengali Ashshin Month the Durga Puja will be Start. Here it's also Called MAHASOSTHI. 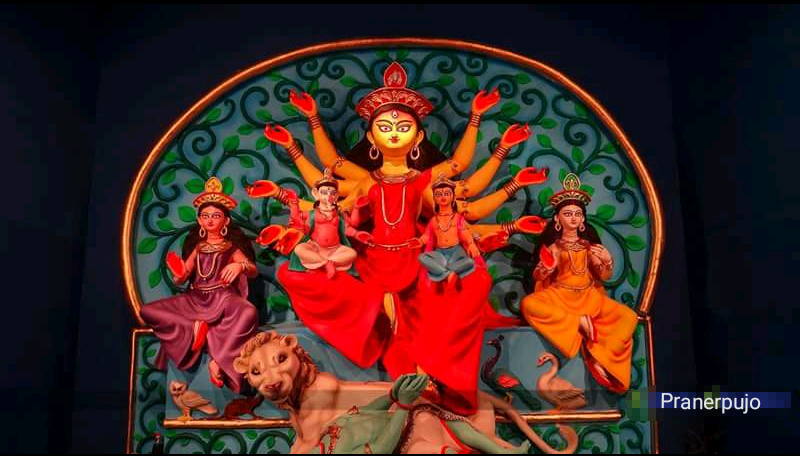 The first Main Day of Durga Puja will be Start of The Bengali Calendar on 29 Ashshin,1425. The most important Day of Durga Puja is Ostomi it will celebrate in this year on 30 Ashshin,1425. After end of the Ostomi Nabami will Start on 01 kartik,1425. 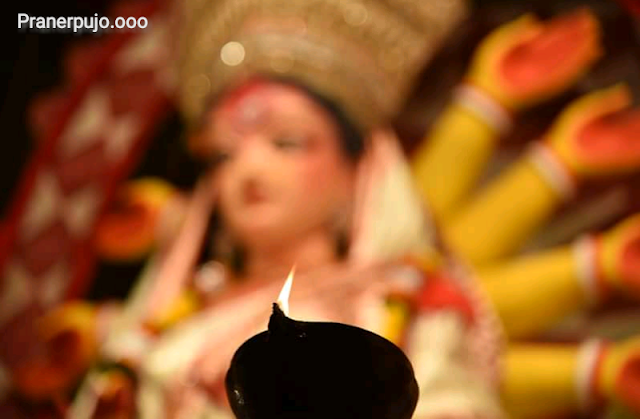 The last of Durga Puja called Dashami will celebrate on 02 Kartik,1425 of in Bengali Calendar. *SO THIS ARTICLE IS HELPFUL FOR YOU. IF NOT THEN COMMENTS US YOUR SUGGESTIONS. WE WILL TRY TO IMPROVE OUR SERVICES.